The R-PLEX Human HGF Antibody Set includes a matched capture and detection antibody pair and calibrator for the quick and easy measurement of HGF in biological samples. R-PLEX products leverage MSD’s electrochemiluminescence technology for better sensitivity and a larger dynamic range than traditional ELISAs. R-PLEX matched antibody sets enable the development of singleplex and multiplex immunoassays. Individual assays may be developed using MSD avidin- or streptavidin-coated plates. Custom multiplex assays with any combination of R-PLEX analytes, as well as R-PLEX plus U-PLEX analytes, can be developed on U-PLEX MULTI-SPOT plates. To learn more about the advantages of R-PLEX products click here. 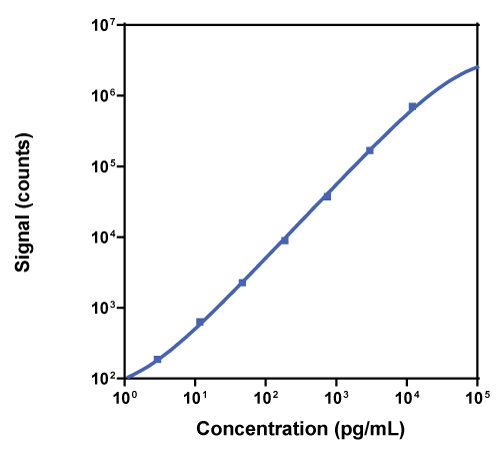 Calibration curve for the R-PLEX Human HGF Antibody Set was assessed and representative data are presented below. Description - Hepatocyte Growth Factor (HGF, hepatopoietin-A, SF) is a potent mitogen for mature parenchymal hepatocyte cells. It regulates cellular proliferation, cell motility, inhibition of cell growth, and morphogenesis after binding to the proto-oncogenic Met receptor. HGF is secreted by mesenchymal cells and is considered a multi-functional cytokine acting on epithelial cells. It plays an essential role in embryonic organ development, angiogenesis, tumorogenesis, tissue regeneration, and wound healing. Human mesenchymal stem cells protect human islets from pro-inflammatory cytokines. Prostaglandin E2: a putative potency indicator of the immunosuppressive activity of human mesenchymal stem cells.